Economy version in black aluminum with silver markings and red pointer. Marking, indicate ranges for too cool causing creosote build up, best operation, and over-heating. Temperatures up to 900 degrees Fahrenheit. 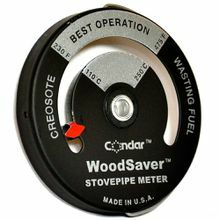 Attaches magnetically to stove top, door, or flue pipe.